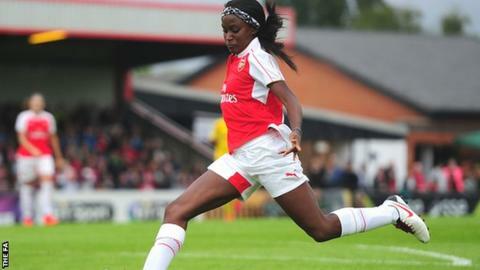 Arsenal Ladies are determined to "inch closer" to the top of Women's Super League One, says winger Chioma Ubogagu. Ubogagu, 22, scored as the Gunners beat Birmingham 1-0 on Sunday to move up to second, two points behind Chelsea. The league leaders were hammered 4-0 by Sunderland on Saturday, their first defeat of the season. "We're proud of ourselves because we knew, after Chelsea let some points drop, this was big for us if we got the job done," Ubogagu told BBC Sport. "When we saw that Chelsea had dropped points, it magnified the importance of this game." Arsenal suffered their first league defeat of the season on 12 July, losing 3-1 at home to Liverpool, but beat winless Birmingham a week later. Just four points now separate the top four teams in WSL 1, while fifth-placed Manchester City are six points off top spot with a game in hand. "I'm really pleased that there are a lot of options," said Arsenal manager Pedro Martinez Losa. "It's competitive. I think this is very good for the league and its very good for the supporters. "Now we have a very important mental moment, getting closer to Chelsea and sending a message to everybody that we are going to be competitive for the league. "We are in a good position now - but so are Chelsea."